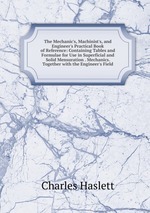 Аннотация к книге "The Mechanic`s, Machinist`s, and Engineer`s Practical Book of Reference: Containing Tables and Formulae for Use in Superficial and Solid Mensuration . Mechanics. Together with the Engineer`s Field"